A large part of All Source Security MFG Corp’s success over the past decade can be attributed to the hard work of the Charlotte, North Carolina distribution center. 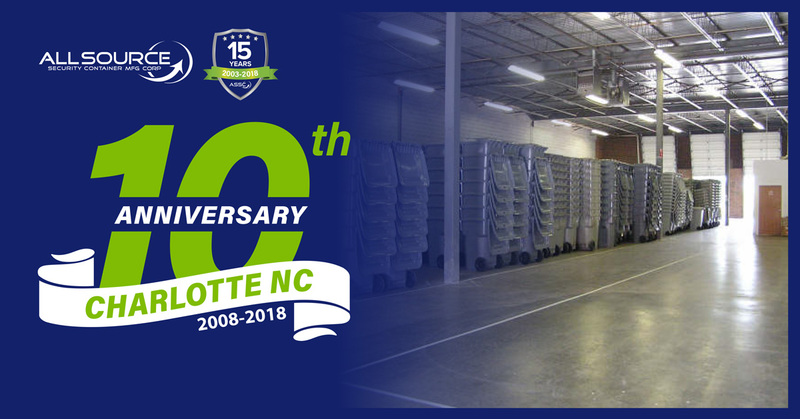 All Source’s first expansion was the Charlotte, NC distribution center, which opened in the spring of 2008 to increase service to the Southern United States. As All Source celebrates their 15 year anniversary in 2018, the Charlotte DC is also celebrating their 10 year anniversary. All Source has created a best in class customer service operation with 3-5 day order lead times as a result of this locations success and hard work. “It is important to recognize events and milestones like this. Achieving our 10th year here in Charlotte reminds us of all the people that supported and contributed to this success. The local business community, suppliers and of course our customers have enabled us to grow and we want to acknowledge and celebrate that.” said Tim Young, General Manager. Achieving 10 years of business success from this location, has allowed All Source to expand their distribution facilities into other states, including: Irving Texas, Phoenix Arizona, along with the head office operating out of Barrie Ontario, Canada. A formal celebration & customer appreciation event will occur at the Charlotte, NC location this June, in which All Source fully welcomes all their loyal customers, suppliers, and preferred partners to join them on celebrating this milestone. Follow All Source on Facebook, LinkedIn, or subscribe to our monthly emails for more information about the 10 year celebration taking place June 20that the Charlotte DC.